Is Roulette The Best Way To Make Money? I do a lot more than just manage roulette teams. I run multiple businesses and, like many other people, have tried many different ways to make money. 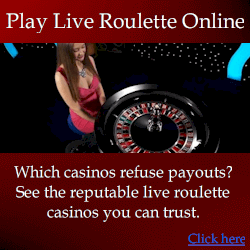 This page explains how roulette compares to other ways of earning a living. Leveraging your existing wealth: The best way to make money is to have money, and use it for various investments. That’s why many wealthy people say “the first million is the hardest to make”. Getting investors: The next best way is to use other people’s money to make large investments. This is exactly what banks and financial institutions do. But in most countries, dealing with funds from investors requires official paperwork such as a prospectus. And often you need to be registered with government organisations. Such organisations are supposed to exist to protect investors, although in my experience, they exist more to protect the interests of big business. This makes it very difficult for average people to combine funds for the purposes of accumulating wealth. Combining funds with others: You could work with 10 family members, each contributing $100,000 each, and you could make a combined $1 million investment. Generally the more you invest, the greater your returns can be. Consider building a casino, which may cost several million dollars. But your investment may be returned several times each year. Try getting those returns with a bank term deposit. Running a business: The most successful businesses offer genuine value to customers. If a business only focuses on making money, without consideration to how customers are helped, it won’t succeed in the long-term. If you create a business with the customer in mind, you will be much more successful. But remember the golden rule of marketing, which is people by what they want, not what they need. You can have a fantastic product that anybody can benefit from, but if no-one wants it, then nobody is going to buy it. Getting a job: Getting a normal job may be the most secure and easiest way of making money. But I personally can’t imagine working eight hours a day for just $150 or so, then losing half of it to tax, to be insanity. Then you have to do it 5 times per week. And don’t forget the peak hour traffic driving to and from work. It sounds more like slavery than living. Professional gambling systems: You are probably expecting me to say that roulette systems are the best way to make money ever. But it’s not the case. Roulette can be an extremely tough game to beat, or it can be remarkably easy. It ultimately depends on the wheel you are playing against, and the conditions in the casino. Further detail is explained below. Beating roulette in a home environment is very easy. Even the most random and modern roulette wheels can be beaten. In fact I’ve never seen any wheel produce truly random and unpredictable spins. But the real casino environment is different. The two main differences are that in the casino are: In real casinos, the wheel spins less frequently. And in real casinos, you must deliberately limit winnings to avoid detection. For example, the average wheel spins once every two minutes. But in some casinos, it can be once every five minutes. This is particularly painful for a professional roulette player, especially when they need 60 or so spins to analyse the wheel. It may not seem like much, but 60×5 is 300 minutes (5 hours). That’s a lot of boring hours at the table. However, if the wheel produces a reasonable edge, the player can earn $5000 or more in the hours after wheel assessment. And they can do this without attracting too much attention from casino staff. Of course a player could earn more with larger bets, but it is important for the player to avoid detection. With a standard 9-to-5 job, it may take many weeks to save $5000. This is because you not only need to earn the money, you also need to cover your living expenses, and pay tax on earnings. So saving the money is not so easy. Clearly in this case, being a professional roulette player appears better. But the downside is if you make mistakes playing roulette, you can actually lose money. However, a professional player sees it differently. They understand that if they properly research a wheel, they will have an accurate idea of whether or not the wheel is profitable before making significantly large bets. Correct application of any roulette strategy does not guarantee profit. A winning roulette strategy is like any investment, where there is calculated risk. Any investment you ever make is always calculated risk, and never guaranteed returns. Looking at it this way, you understand that every spin you play, and every wager you make, has its own risk versus reward. Or more specifically, risk versus return. Even the casinos themselves see it this way. They understand that any player can win large sums of money if they are lucky. But because of the house edge, the casino has an inbuilt advantage that virtually guarantees they will profit. 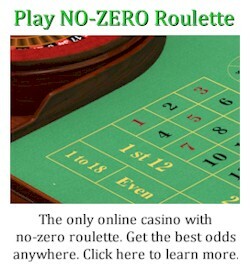 Having a genuine winning roulette system is no different. The player has a long term advantage over the casino. And while it doesn’t guarantee profit, it strongly tips the odds in the players favour. The single biggest problem any professional player faces is avoiding detection. Because if you are detected, the casino will do whatever they must to prevent you winning. This will typically be something like moving or recalibrating the wheel, which will change the patterns. Some casinos, although very few, recalibrate their wheels on a daily basis. This means that patterns often change, and any old data collected by professional players becomes obsolete. This is not always the case though. Because if the wheel is recalibrated with precision each time, then the patterns won’t change. It’s only really a problem if the casino doesn’t precisely recalibrate the wheel, which unfortunately is the case. But the good side of this is it then means a very difficult wheel can suddenly become very profitable, and you can often exploit it and profit before the casino even realizes. In casinos that do recalibrate their wheels daily, players will have no problems achieving success if their strategy involves quick analysis and play, before the wheel is modified or recalibrated. A roulette wheel bias player, who may require thousands of spins for analysis, is not likely to be successful. But a user of the JAA system, visual ballistics, dealer signature roulette computers, or any other method that allows rapid analysis of wheels, is likely to be unaffected by a casino’s frequent adjustment of wheels. At most, it can be an inconvenience to professional players, because they need to repeat the initial data collection process. Still the time you spend doing this is more profitable than the average 9-to-5 job. If you are already wealthy, you can make a lot of money very quickly in VIP rooms by playing roulette. 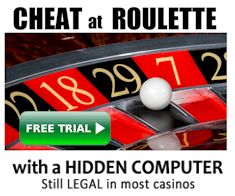 You can easily apply the hit-and-run approach, where you make large bets based on roulette computer predictions. Your winnings will be relatively quick and easy, and appear more like luck. But if you are already wealthy, then you may find it easier to make money by making strategic investments. I suggest real estate, but not necessarily in the jurisdiction where you live. For example in Australia, where I live, the government imposes very large taxes called “stamp duty” whenever you purchase a property. This greatly reduces your profits in the short term, so you cannot rapidly buy and sell properties like stocks. If you are like most people, and have a modest betting bankroll between $500-$1000, then roulette may still be one of the best investment opportunities for you. I know players that made over $1 million starting from just $2000. When you have an advantage over the casino, profits accumulate very quickly. But don’t expect every wheel or casino to be remarkably easy to beat. If you attempt play on a difficult wheel, you will only end up losing money, and a lot of time. If you find easily beaten wheels, then you can earn large sums with very little investment. Again it all comes down to where you play. On the average wheel, and in the average casino conditions, I wouldn’t say roulette is the easiest way to make money. It is actually quite tedious and boring. And many times you can become frustrated with the lack of success. This is all part of the game as a professional player. But when you do find the right wheel and conditions, the results are very rewarding. Even with a modest bankroll of $500, you can profit tens of thousands of dollars in a matter of weeks, without the casino having any idea. And again although you could earn much more, the main limitation is what you can win without being detected. For the average casino, taking less than $5000 in a 24 hour period is unlikely to draw much attention. So roulette can be very profitable even for small-time players. But is it suitable to earn a living? Well if you are supporting a family, you won’t have a regular and dependable wage. A family needs security. But with roulette, there may be times where the casino’s wheels are all too difficult to beat. And this period may last many weeks, until something changes and the wheels are easily beaten again. So it is not something you can realistically depend on for a regular income. Don’t get me wrong. There are many players who play roulette for a living, although most of them are single without families. But even their income is irregular. For example, they may play two times in a month and profit $30,000. Then they may not play at all for the next 3 months, because perhaps their local casino’s wheels have been calibrated. And the patterns may not become predictable again for some time. So it’s a bit like rain. Sometimes there’s heavy rain, and sometimes there’s a drought. At least that’s how it is if you have very few wheels to choose from. But if you live in an area with plenty of wheels and casinos to move between, you are much more likely to achieve a regular and dependable income.